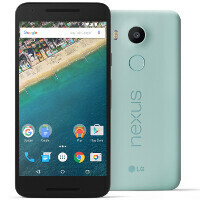 Google just took the wraps off its much-anticipated Nexus entrant for the year, and it turned out the be two entrants for the first time - the LG-made Nexus 5X, and the larger, more premium and more expensive Nexus 6P. Given that users have come to associate the Nexus line with sold-near-cost poster kids for the newest Android version, the 5X may be the one with more sales, though it also offers less than the 6P. The Nexus 5X comes with a 5.2" 1080p display, Snapdragon 808 silicon, 2 GB of RAM, and a new 12.3 MP camera on the back that offers large, 1.55 micron pixels to rake in more light. The phone is built from polycarbonate, colored in black, white and a new "Ice Blue" color, which looks pretty cool, as you can see for yourself in the slideshow with all the official images of the new Nexus below.